What is another word for locker? A drawer, cupboard, compartment, or chest, esp. one in a ship, that may be closed with a lock. 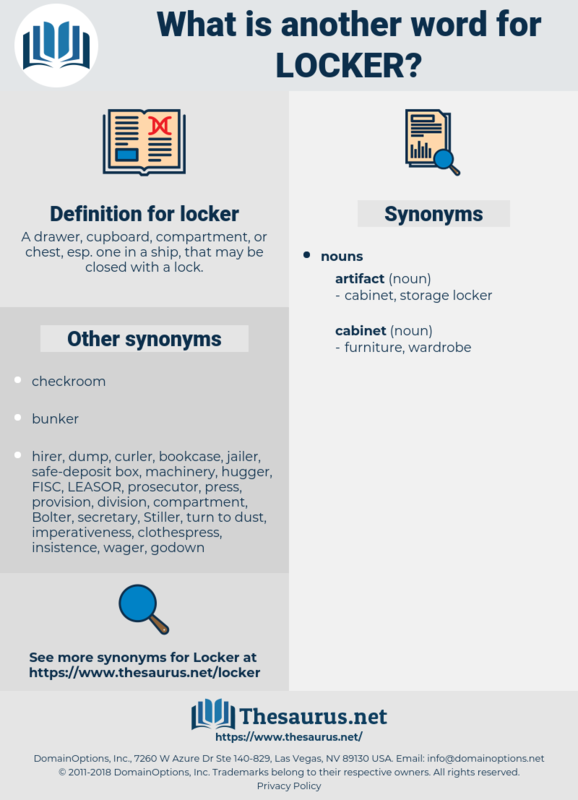 cloakroom, closet, wardrobe, cupboard, lockbox, cubicle, warehouse, store. This here's the cabin, and there ought to be a locker here, with matches in it, and a lamp. There was nothing to eat aboard; but in the locker at the stern he discovered a small keg filled with water, overlooked probably when the boat was unloaded, for it was the same craft in which the trip up the African river had been made. Le Carre, lag screw, lecher, liqueur, leisure, laser, Loch Achray, leucorrhea, lasher, lugger, lechery, laager, luggage carrier, lakeshore, lagger, lazar, leaker, lesser, lacquerware, liakoura, logorrhea, leger, luger, liguria, low gear, leisure wear, luxuria, lacquer, liquor, logger, liger, Lake Erie, Lake Eyre, leukorrhea, lascar, loser, lager, lessor, lock washer, luxor, lozier, lucre, Locher, laugher, looker, lacer, luxury. fastening, holdfast, fastener, compartment, fixing.